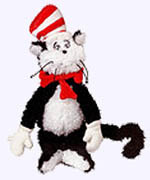 This beloved Dr. Seuss character comes to life in this ultra-soft, extra-billowy Cat in the Hat plush toy. A timeless, huggable companion or an eye-catching complement to any nursery, the Cat in the Hat 24" (18" sitting) plush makes a perfect gift for little ones or older ones. Surface washable. 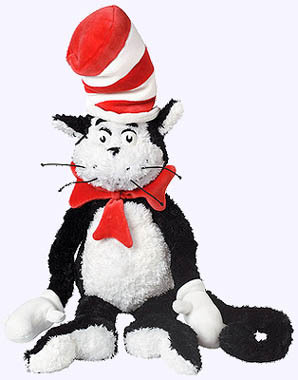 This 18" (14" sitting) stuffed toy is carefully constructed and highly detailed to match the Cat in the Hat character that so many have grown to love. 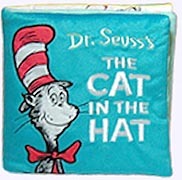 Read along with your very own Cat in the hat plush. Surface washable. 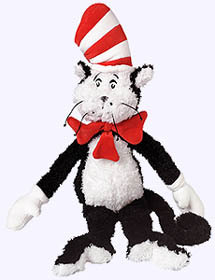 Enjoy reading your favorite Dr. Seuss stories and your playtime with this 12" (9" sitting) Plush Cat in the Hat Plush Doll. Surface washable. There are few better gifts than a copy of The Cat in the Hat. 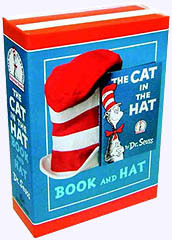 In the Cat in the Hat Book and Hat boxed set there is a copy of the beloved Beginner Book - packaged in a sturdy, reusable storage box (with magnetic closure) - along with a kid-size red-and-white striped felt Cat hat. Ideal for family fun - the hat fits on most adult heads, too - this is a gift the whole family can enjoy together. It's perfect for birthdays, holidays, and happy occasions of all kinds. Boxed Set - Book and Felt Hat. Ages 3 and up. A giftable, huggable introduction to Dr. Seuss's antic classic The Cat in the Hatperfect for babies and toddlers. From its padded, plush velour cover to its Seussian text and lovely box, this deluxe cloth book is a perfect baby shower gift, ready for gift wrap! Cloth padded Book. Safe for all ages. 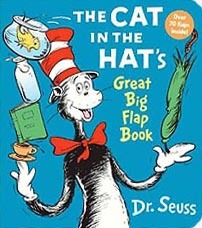 Now for the first time ever, the Cat in the Hat appears in a silly, Seussian flap book, which offers loads of learning and lots of laughs and is packed with over 50 seek-and-find flaps that help teach basic concepts such as colors, numbers, letters, shapes, and opposites! Hard Cover Lift-the-Flap Book. Ages 3 - 5. 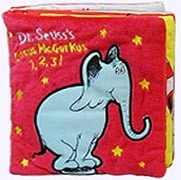 Based on Dr. Seuss's classic If I Ran the Circus, this deluxe soft-padded cloth book has bright colors and signature rhymes. A rattle is sewn inside the center page, with a velcro closing pull-out flap provideing engaging play. Cloth padded Book. An interactive, touch-and-feel story invites toddlers to explore the soft beds, bellies and pillows of iconic sleepy characters, in an edition published to commemorate the 50th anniversary of the classic, Dr. Seuss's Sleep Book. Board Book with soft stuff to snuggle with, fluff, and squish! Ages 1 - 3. 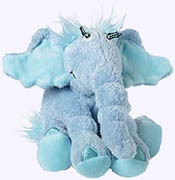 Read the Horton Hears a Who story with this cuddly plush character. Plush Doll is 9" tall. Ages 3 & up. Surface Washable. 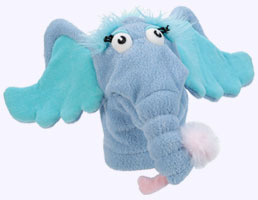 Act out Horton Hears A Who with this soft hand puppet. Puppet is 10" long from top of his head to the end of his trunk. Padding inside his head keeps a child's hand forward while animating his trunk and mouth. Ages 3 & up. Surface Washable. 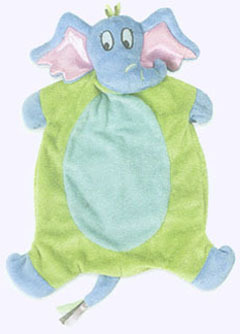 Horton Blankie is 16" long and is a great friend to ride along in a stroller or to tag along anywhere. Babies and toddlers will love this blankie pal to snuggle with. Ages 0+. Surface Washable. 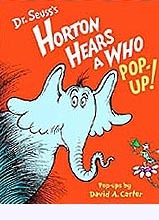 Unlike other pop-up adaptations that use text abridgments, this book contains the complete text of Horton Hears a Who! 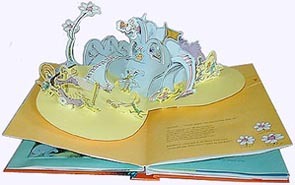 David A. Carter has skillfully followed Seuss's signature pacing by alternating five big, blow-out pop-ups with 11 booklets, pull tabs galore, and many special effects. In all, ten glorious spreads bring this classic to life in magnificent full color. Hardcover by Theodor Suess Geisel, Pop-up by David A. Carter, All Ages. 10" tall Grinch is a perfect companion for youngsters as they read How the Grinch Stole Christmas. Ages 3 & up. Surface Washable. How the Grinch Stole Christmas! 50th Anniv. Inside this very special anniversary edition of How the Grinch Stole Christmas!, you'll find the complete, original text and illustrations by Dr. Seuss, along with 32 fascinating pages of commentary, footnotes and archival images. The Grinch tries to stop Christmas from arriving by stealing all the presents and food from the village, but much to his surprise it comes anyway. Hardcover Picture Book. 50th Anniv. Ed. Ages 4 - 6. Straight from the pages of the classic Dr. Seuss story, The Lorax! The Lorax is the prefect grumpy yet charming orange friend for any story time adventure. Lorax Plush is 6" tall and 6" wide. Ages O+. Surface Washable. 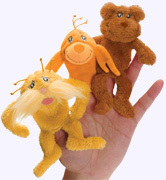 Bring the Dr. Seuss story of The Lorax to life with this finger puppet set of The Lorax and two Forest Critters. Create a one-of-a kind tale with these three delightful finger puppets, or act out your favorite parts of the classic story! Ages 3 & up. Surface Washable. 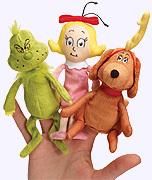 Finger Puppets are The Grinch, the Grinch's dog Max and Cindy-Lou Who. Ages 3 & up. Surface Washable. 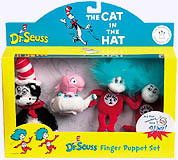 These puppets come in their own box and are just right for younsters as they tell the Dr. Seuss stories. Finger Puppet Set features Thing 1 and Thing 2 and the One Fish, Two Fish. Ages 3 & up. Surdace Washable. 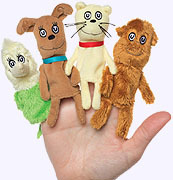 The whimsical story of Dr. Seuss's What Pet Should I Get can now be retold again and again with the help of these delightful finger puppet characters. Ages 3 & up. Surface Washable. It's show time! 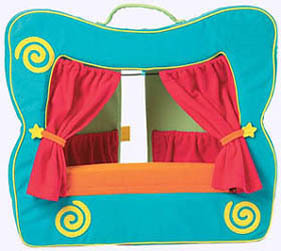 This soft and colorful finger puppet theater includes stage curtains that can be opened and closed and two large pockets for puppet storage. Theater also features a handle for ease in travel and is ready for storytime with the Cat in the Hat Finger Puppets or other favorite finger puppets. Theatre is 15"L x 2"W x 14"H. Ages 3 & up. This never-ever-before-seen picture book by Dr. Seuss about making up one's mind is the literary equivalent of buried treasure! What happens when a brother and sister visit a pet store to pick a pet? Naturally, they can't choose just one! The tale captures a classic childhood moment - choosing a pet - and uses it to illuminate a life lesson: that it is hard to make up your mind, but sometimes you just have to do it! 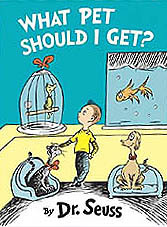 An Editor's Note at the end discusses Dr. Seuss's pets, his creative process, and the discovery of the manuscript and illustrations for What Pet Should I Get? Hardcover Picture Book. 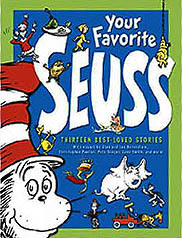 Here in one big volume are 13 classic Dr. Seuss stories. All of the words and virtually all of the illustrations are included. Each story is prefaced by a short essay by someone whose life was changed by Dr. Seuss or who is simply an unabashed admirer. Also included are photographs of Dr. Seuss, memorabilia, and original sketches from his books. 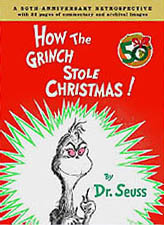 The stories included are: And to Think That I Saw It on Mulberry Street, Horton Hears a Who!, McElligot's Pool, If I Ran the Zoo, Happy Birthday to You!, Dr. Seuss's Sleep Book, Yertle the Turtle, The Cat in the Hat, How the Grinch Stole Christmas!, Green Eggs and Ham, The Lorax, The Sneetches, and Oh, the Places You'll Go! Hardcover Treasury. 368 pages. Ages 4 & up. 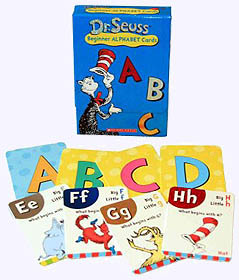 Includes 26 alphabet cards, an instruction sheet for games and learning activities, and basic tips for teaching children to know their letters from A to Z. Ages 2 - 7. ...and always: silly Seuss rhymes. Ages 2 - 7. 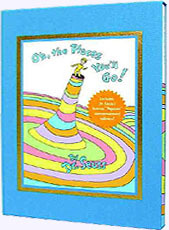 A collector's cloth-bound, slipcased edition of the best selling final work of the inimitable Dr. Suess celebrates the vast possibilities that exist along the journey of life. Advice in rhyme for proceeding in life; weathering fear, loneliness, and confusion; and being in charge of your actions. 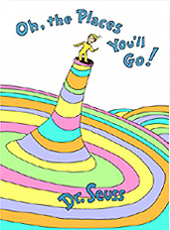 Includes Dr. Seuss's famous "Popover" commencement address! Hardcover 25th Anniversary Edition, All Ages. For out-starting upstarts of all ages, here is a wonderfully wise and blessedly brief graduation speech from the one and only Dr. Suess. In his inimitable, humorous verse and pictures he addresses the Great Balancing Act (life itself, and the ups and downs it presents) while encouraging us to find the success that lies within us. Hardcover, All ages. Oh the Places on Earth! Foster a child's love of reading - and of the natural world - with this boxed set Titles include If I Ran the Rainforest: All About Tropical Rain Forests; Would You Rather Be a Pollywog? All About Pond Life; Ice Is Nice! All About the North and South Poles; and Why Oh Why Are Deserts Dry? All About Deserts. There's something (or someplace) to pique the interest of every child. Oh, the places you can read about with the Cat in the Hat! Paperback set in slip case. 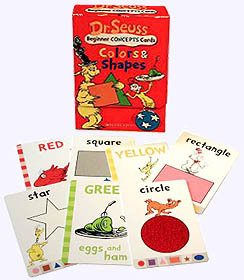 This first beginner book collection of five of Dr. Seuss stories features; The Cat in the Hat, Hop on Pop, Fox in Socks, Geen Eggs and Ham and ,One Fish, Two Fish, Red Fish, Blue Fish. Paperback set in slip case. Ages 4 - 6. This second beginner book collection has five more of Dr. Seuss stories: Oh Say can you Say? ; Oh, the Thinks you can Think! ; I can Read with My Eyes Shut!, Dr. Seuss's ABC; and The Cat in the Hat Comes Back. Paperback set in slip case.